Emoji icon is displayed in Google Keyboard in some places by default. But, you can add emojis in any App using a hidden feature. Emojis are nowadays used everywhere on Internet. It helps to express feelings in a more personal and minimal way without any text. 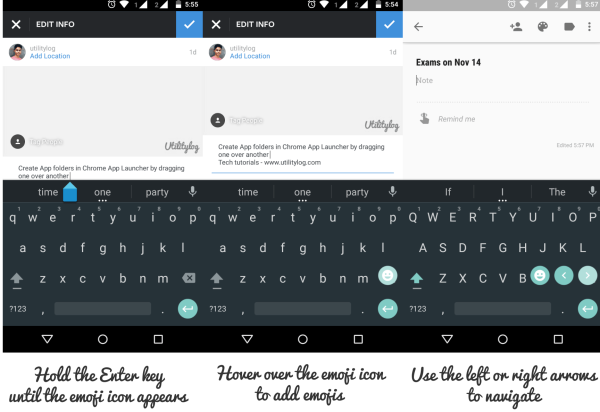 Google Play Store has a huge number of third-party keyboards that offer many customization features though the default Google Keyboard provides you a much cleaner and stock Android experience. With Google Keyboard, you can add emojis to your text. But, the problem is that if you use Google Keyboard on any Apps, the emoji icon is hidden. This tutorial will help you to add emojis in any App (Android 4.4+). The emoji icon is displayed in the Google Keyboard say when you are typing a text, etc., But, in many Apps, it is hidden and the Enter key is shown. To use emoji, you must long press the “Enter” key located in the bottom-right corner, until the emoji icon appears and then, hover your fingers over the emoji icon. When you’re done, you need to tap the “ABC” icon to return to plain text. Add emoji in any App using Google Keyboard by holding Enter key. In some cases such as Google search, instead of Enter key, search icon or some other icon (like left arrow or right arrow) is displayed. You need to repeat the same steps again to add emojis. There is also another useful feature — When you hold the Enter key or search icon, there is also left arrow and right arrow displayed along with emoji icon to provide navigation. Note that, this feature varies from place to place (in some places, only left arrow is displayed or right or both or none is displayed).